U.S. Air Force photoAirman 1st Class Benjamin Gonsier Aircrew personnel steer a parachute during a simulation on Barksdale Air Force Base. 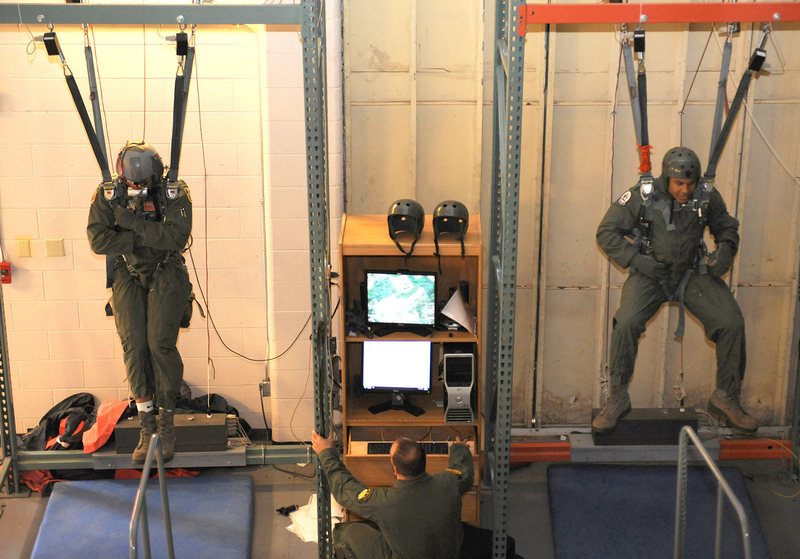 The parachute simulator can be programmed to put aircrew members in multiple scenarios, some of which include landing in large bodies of water, an urban environment or having to maneuver through strong winds. BARKSDALE AIR FORCE BASE — The resources needed to refuel and maintain a plane just so aircrew can receive real-life parachute training would cost millions of dollars a year. Instead, aircrew personnel receive their parachuting training inside a simulator, which gives them experience similar to the real thing. According to Slaton, parachuting is a perishable skill that must be relearned often, which is why aircrew personnel are required to receive this training annually. Before getting inside the simulator, aircrew personnel receive classroom instruction on the basics of parachuting and how to work their way out a crisis. Slaton is an experienced military freefall parachutist. Aircrew personnel use the same equipment Slaton has used and are confident in it. Aircrew personnel never want to be in a situation where they need to use this training. However, if they ever get into an emergency situation where a bailout is a must, they will have the confidence and tools needed to get home safely.